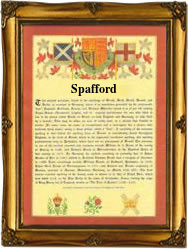 This name is of English locational origin from a place in the North Riding of Yorkshire called Spofforth. Recorded as Spoford in the Domesday Book of 1086 and as Spotford in the 1218 Fine Court Rolls of that county. The name derives from the Olde English pre 7th Century 'splott' later 'spot' meaning a spot of plot of land, plus the Olde English 'ford', a ford. The surname from this source is first recorded in the early 13th Century, (see below). One, Robert de Spofford appears in the 'Register of the Freemen of the city of York in 1310. In the 'modern' idiom the name is spelt Spofford, Spofforth, Spawforth and Spafford. (As a second element 'ford' often took the form 'forth'). On December 17th 1741 Thomas Spafford and Ann Ducket were married in Drypool, Yorkshire. The first recorded spelling of the family name is shown to be that of Hynge de (of) Spoufford, which was dated 1212 - 'The Pipe Rolls of Yorkshire', during the reign of King John, nicknamed Lackland 1199 - 1216. Surnames became necessary when governments introduced personal taxation. In England this was known as Poll Tax. Throughout the centuries, surnames in every country have continued to "develop" often leading to astonishing variants of the original spelling.